I've been taking a hand piecing class on Saturday mornings for the last few weeks. 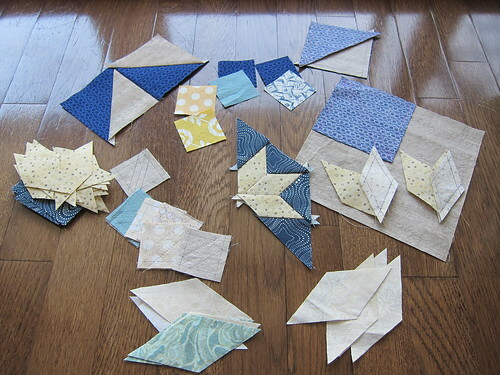 We're making a small throw sized star sampler quilt. A photo of the projected finished product is here. Lovely, don't you think? I decided to use a palette of aqua, yellow, cream, and navy. A bit of a departure for me but I was trying to push outside of my comfort zone a bit. Every week, I go to class, cut out and mark the pieces for each block and work on sewing a few together. Unfortunately, I haven't had much time to work on it between classes. 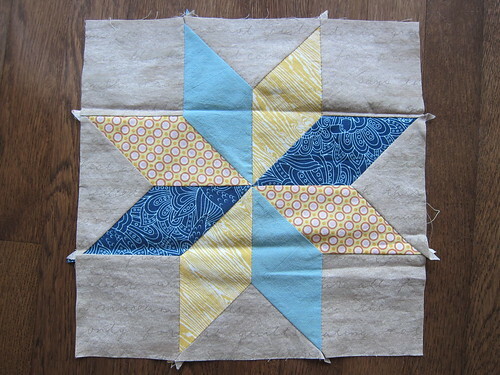 While heading into week 7 of the class, I've only finished the first (and simplest block): the Lemoyne Star. This has created a veritable confetti of tiny, (mostly) bias cut pieces. These are the pieces for only three of the six blocks. Aside from my endless paranoia that I'll loose a piece or stretch a bias edge beyond recognition, I'm really enjoying slowly piecing all those little bits together to make something beautiful. They're looking great Amanda, and it's always fun to try something new!